In 1852 London, William provides for his family by selling seeds. But he really wants to work with bees and build the beehive that will finally make his mentor proud of him. George is an American beekeeper in 2007 who still builds his own hives, even as something strange happens to bee colonies around the world. Tao lives in China in 2098. The bees have been gone for a long time, so Tao and her co-workers painstakingly paint pollen onto trees to grow fruit. When her son is injured, Tao sets out to find out what happened to her son, the bees, and the world. 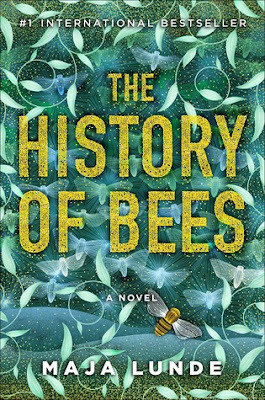 The History of Bees is, as you might expect, a story about what happens to bees over the centuries and how humanity interacts with nature. But it's also about the ways that people relate to each other and what we need to feel successful in our lives. In the 19th century, William is driven to bed by depression and readers witness his family deal with his illness and their dwindling resources in various ways. George tries to reconcile his love for the farm life he has always known with his love for his son, who finds purpose in words instead of manual labor. And in the future, Tao is resigned to her life as long as her child can have something better. When an accident destroys that hope, she becomes an angrier, more desperate person who is willing to do things she never would have imagined. This novel seems important in so many ways. The future of bees will impact our future as humans. But this story is also about work, the difference between a job and a calling, and how we give our attention to our work and the work that accompanies being a spouse, a parent, and a person in the world. The three storylines might feel forced with a different author, but Lunde succeeds in making the reader care for each of them and brings them together in a very satisfying way.